Good stuff in, great stuff out. That’s been our MO for over 20 years, so why stop now? GAME CHANGER™ is proof that when you develop products with premium, science-based ingredients, results come fast and furious. A sports drink that works as hard as you do. This optimally dosed complex includes a 2:1:1 ratio of vegan BCAAs (short for “branched-chain amino acids”). 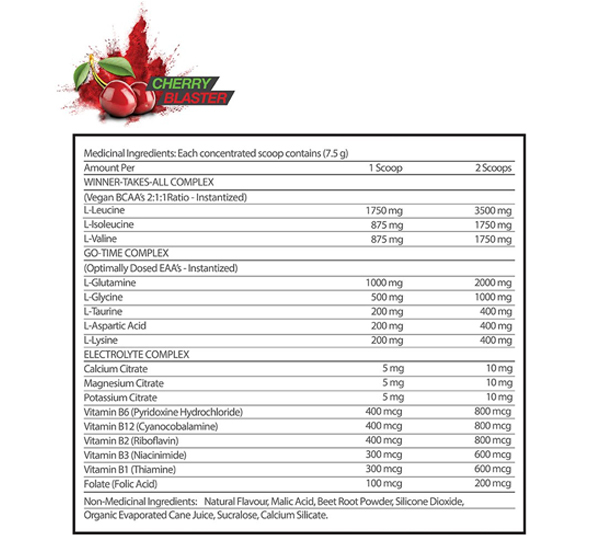 Each scoop provides 1,750 mg of L-Leucine, 875 mg of L-Isoleucine, and 875 mg of L-Valine. So why all the hype about BCAAs? Because they deserve it. BCAAs promote protein synthesis in the body, which directly impacts muscle growth, muscle recovery, and even muscle preservation. (No sense building lean muscle only to lose it, right?). Regardless of your sport, the stronger you are, the better you’ll play. Our Winner-Takes-All Complex has your back in this department so can you seize the benefits of a better-built physique. Just like the name implies, EAAs (or “essential amino acids”) are a must-have if you’re trying to increase strength, build muscle, and boost performance. As intuitive as your body is, it can’t synthesize EAAs on its own; you need to consume them through diet. GAME CHANGER™ takes the guesswork out of how and when to get your EAAs with its precisely dosed Go-Time Complex. In it, you get all the mighty EAAs your hard-working body needs for peak performance, including L-Glutamine, L-Glycine, L-Taurine, L-Aspartic Acid, and L-Lysine. As an athlete, you know the importance of staying hydrated. You’re probably carrying a reusable water bottle as we speak. But while H20 is great, your body demands more – especially before and during intense exercise. It needs additional nutrients/electrolytes that water simply can’t provide. GAME CHANGER™ steps in by delivering a targeted and vital spectrum of electrolytes to replace those lost during exercise, mostly through sweat. This helps keep your energy levels cranked while you train or play. The Electrolyte Complex is power-packed with Calcium, Magnesium, Potassium, Folic Acid, and a range of B Vitamins to fuel your performance and optimize overall health. 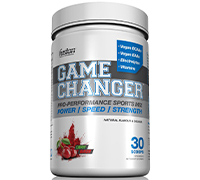 GAME CHANGER™ is your go-to supplement pre-game or pre-workout to fuel up for what’s ahead. It’s also there for you, mid-activity, to continue the momentum. Whenever your moment of truth arrives, be ready for it with GAME CHANGER™.